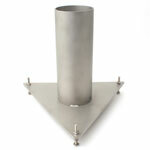 The 255-214 Hook Gauge is used to measure water level changes inside an evaporation pan. NovaLynx produces a micrometer-style hook gauge that conforms to the classical US Weather Bureau style hook gauge. The 255-214 Hook Gauge is used to measure water level changes inside an evaporation pan. NovaLynx produces a micrometer-style hook gauge that conforms to the classical US Weather Bureau style hook gauge. 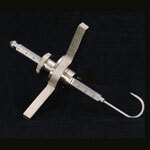 It features a sharply pointed "U" shaped hook attached to a calibrated stem and a micrometer dial. 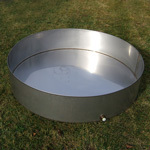 Measurements are made by placing the hook gauge into an evaporation pan and on top of a stilling well. The micrometer dial is rotated until the point at the end of the hook pierces the water's surface from below. As the water evaporates, the hook point is moved to the new surface position. Adjustments to the hook's point are made daily and the new dial reading is recorded to determine the amount of water loss.